Stolina Dobreva (Phd) was born in 1970 in Bourgas, Bulgaria. 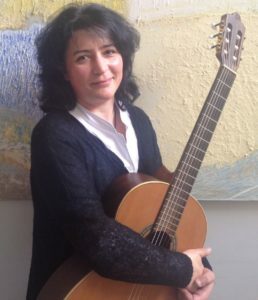 She graduated the National School of Music “Lyubomir Pipkov” in Sofia, Bulgaria and graduated guitar and pedagogy in the “Staatliche Hochschule für Musik”, Freiburg, Germany in the class of Professor Sonja Prunnbauer with excellent marks. Stolina has won second and third prizes at the National Guitar Competition in Chirpan in 1985 and 1987, third prize at the International Guitar Competition in Hof, Germany, and third prize at the First National Competition “Apolonia” – Sozopol, Bulgaria. She has participated in master classes of Alvaro Pieri, Robert Brightmore, Carlo Domeniconi, Alexander Frauchi etc. Since 1994 she has been teaching guitar and chamber music at the National School of Music ”Lyubomir Pipkov”. Her students have been awarded more than 150 prizes at national and international competitions in Bulgaria, Austria, Germany, Poland, Romania, Italy, Belgium. Stolina Dobreva is the author of a series of scientific publications in the field of the guitar history. Since 2001 she is the Editor-in-chief of the “Guitar” Magazine. She has a PhD on subject “The History of the Guitar in Bulgaria. Literature, pedagogy, performance”. Stolina Dobreva is a jury member in several competitions in Bulgaria and Romania. In 2006 she held a master class at the Sinaia Guitar Festival. She has held concerts in Bulgaria, Germany, Hungary, Turkey etc. and realized many records for the Bulgarian National TV and Radio.